Verdict: Shelf the coal-fired power plant, Save the monkey? 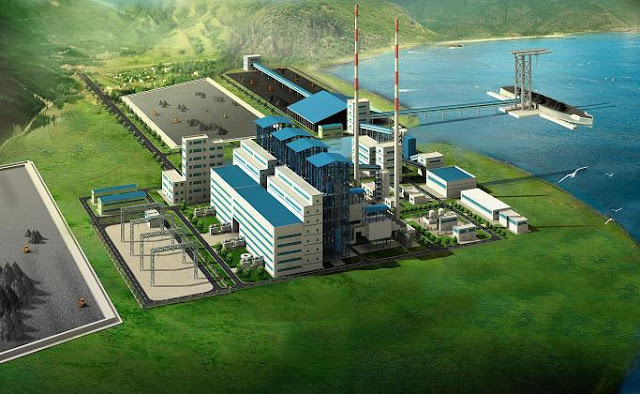 Artist's impression of the coal-fired power plant in Lahad Datu. Credit to: SESB Corporate News. Please dump the heading. Don't take me literally. The title implied nothing about insulting anyone, any individual, any NGO nor does it implies my support for a coal-fired plant. It's just to express what is currently being adopted. The plan to build it has been "halted" (read: it may be re-proposed by SESB) due to Department of Environment's rejection of the impact assessment (DEIA). What a cool call by DOE. Decision should be made based on fact and with professionalism. Our Chief Minister said that Coal-fired plant in Lahad Datu is the best solution to address the power supply problems in the East Coast. The Star quoted Datuk Masidi of saying Coal power plant in Sabah is history. He was assuming that's the end of the story. How I wish I can make the same assumption...! Earlier this year our lost 'love spark' with coal-fired plant was re-ignited with the Minister of Energy, Green Technology and Water - Datuk Peter Chin - saying that the Federal Govt will be talking again with the State Govt to re-discuss the proposed plant. Okay, so much for a Green Technology there. After reading that the proposed project was suspended, I tought I would not want to write anymore about this. It seem I was wrong. We really need to know facts and figures about other alternatives now that it apparently is not the end of story on the 'dirty energy' just yet. For a start, to generate 1MW of energy through Solar, it'll require a land of about 6 acres to generate; not talking about cost yet. Note that 1MW (1000kW) is barely sufficient to power up a medium-sized timber complex or palm-oil mill. Just to keep you pondering. Currently Malaysia has 6 coal-fired power plant, including 2 in Sarawak. If you have Sarawakian friends, ask them about their experience. "We have committed to purchase 100MW from Biomass. If ANYONE can provide 100MW tomorrow, we will purchase it tomorrow!" - Ir Abd Razak Sallim, Senior General Manager, SESB. He mentioned this during a seminar/briefing. I can quote a date and place if anyone's interested. There you are, it's a challenge + opportunity.